Acting on any significant changes to the Child Protection Plan following decisions made at Review Conferences or in relation to decisions to take legal action. Where any member of the Core Group is aware of difficulties implementing the Child Protection Plan due to changed or unforeseen circumstances, the Lead Social Worker must be informed immediately and consideration given to recalling the Core Group meeting to re-consider the Child Protection Plan. Circumstances, about which the Lead Social Worker should be informed, include the inability to gain access to the child who is subject to a Child Protection Plan, for whatever reasons, on two consecutive home visits. If the difficulty in implementing the Child Protection Plan impacts on the safety of the child, the Lead Social Worker and all Core Group members should consider the need for a Section 47 Enquiry and / or bringing forward the date of the Review Child Protection Conference and / or for immediate legal action. If the situation remains unresolved, the matter should be discussed with the chair and where necessary referred to the senior child protection manager. See Resolution of Professional Disagreements Procedure for additional information on the procedure to be followed. Membership of the Core Group will have been identified at the Child Protection Conference and must include the Lead Social Worker / Lead Social Worker's manager as chair. It will include both parents/carers, child (if appropriate) and other relevant family members. If the Core Group is unable to include both parents due to risk or because one or other of the parents is unable to attend due to work or other commitments, then the lead Social Worker should ensure that his or her participation can be achieved by alternative means, e.g. the views being sought prior to the Core Group, reported to the Core Group meeting and a copy of the minutes of the Core Group being provided to the non-attending parent. Professionals and foster carers in direct contact with the child should also be included. Working Together to Safeguard Children 2018, Flowchart 5, What happens after the child protection conference, including the review? states that the date of the first Core Group meeting must be within 10 working days of the Initial Child Protection Conference. This date must be arranged at the end of the conference, along with an indication of the required frequency of subsequent meetings. Good practice would be for the Core Group to meet within 6 weeks of their initial meeting, and at a minimum frequency of once every 2 months following the first Review Conference. More regular meetings may be required according to the needs of the child. Where the Review Conference recommends major changes to the Child Protection Plan, the Core Group should meet within 10 days of the conference. Dates for future meetings must be agreed at the first Core Group meeting following each conference. The plan will be outlined at the Child Protection Conference and the Lead Social Worker and Core Group are responsible for ensuring it is drawn up in detail and acted upon. The Core Group will, as described above, regularly review and where necessary modify the Child Protection Plan. The Child Protection Plan will constitute an agenda item at each Review Conference. The Child Protection Plan should be used to clarify expectations and assist in joint working towards shared goals. It can also be used as evidence, in any legal proceedings, of the efforts made to work in partnership (this must be made clear to parents). An outline plan must be drawn up at Initial and Review Conferences, following the decision to develop a Child Protection Plan or continue with that plan. 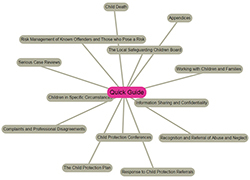 (see Actions and Decisions of the Conference Procedure, Outline Child Protection Plan) . The aim of the outline plan is to assist the Core Group to form a clearer focus of work with the family and to explicitly define individual professional responsibilities. The Child Protection Plan should be based on the findings from the assessment, following the dimensions relating to the child's developmental needs, parenting capacity and family and environmental factors, and drawing on knowledge about effective interventions. Where the child is also the subject of a Care Plan, the Child Protection Plan should be part of the Looked After child's Care Plan. Lay down points at which progress will be reviewed and the means by which progress will be judged. The Child Protection Plan should take into account the wishes and feelings of the child, and the views of the parents, insofar as they are consistent with the child's welfare. Both child and parents should be provided with the opportunity to record their comments, including areas of disagreement. If the aim and content of the plan has not been discussed with any of the parties / agency concerned, the reasons must be stated on the plan. Any dissent about the plan, by family or professionals, must be recorded, with reasons. If family members' preferences are not accepted about how best to safeguard and promote the welfare of the child, the reasons for this should be explained. Families should be told about their right to complain and make representations, and how to do so. The Lead Social Worker should make every effort to ensure that the child and parents have a clear understanding of the planned outcomes; that they accept the plan and are willing to work to it. If the parents are not willing to cooperate in the implementation of the plan the local authority should consider what action, including the initiation of Care Proceedings, it should take to safeguard the child's welfare. The plan should be constructed with the family in their preferred language and they should receive a written copy in this language. The Child Protection Plan should be explained to and agreed with the child in a manner which is accordance with their age and understanding. The Lead Social Worker must record the Child Protection Plan and circulate it to all Core Group members and the conference chair within 5 working days of the meeting. All agencies are responsible for the implementation of the Child Protection Plan and all professionals must ensure they are able to deliver their commitments, or if not possible, that these are re-negotiated. Ensure that the child's bedroom/where the child sleeps is seen at least every six visits (see below). The frequency of contact by Lead Social Worker or Core Group members detailed above is the minimum standard. In exceptional circumstances the Core Group may decide that the required contact level should be less frequent. Any such decision should be authorised by Children's Social Care line manager / child protection adviser. If the Lead Social Worker has difficulty obtaining direct access to the child, the Children's Social Care line manager must be informed, as well as other Core Group members. In these circumstances formal agreement must be reached that a member of another agency carry out the face-to-face contact, or that a Review Conference is called. Such a decision must be recorded and authorised by managers of the agencies concerned and agreed in the Child Protection Plan. See also Uncooperative or Hostile Parents Procedure. The date, time and content of any communication which relates to the child and family (distinguishing between fact and opinion). When there are significant difficulties in carrying out the Child Protection Plan. The request to bring forward the date of a Review Conference should be made by a Strategy Discussion/Meeting of a Section.47 Enquiry or by the Lead Social Worker following consultation with Core Group members, the conference chair, and must be authorised by the first line manager. Confirm the visiting frequency of the Lead Social Worker and the frequency of Core Group meetings. The manager must arrange cover for the Lead Social Worker in case of sickness and ensure arrangements are in place when the Lead Social Worker is on annual leave and training, including the checking and any necessary action, resulting from post, e-mails and telephone contacts. Intervention must be provided to give the child and family the best opportunities of achieving the required changes. If a child cannot be cared for safely at home, (s)he will need to be placed elsewhere whilst work is undertaken with both child and family. Intervention should address the child's needs and may involve action to promote her or his health, development and safety, particularly with regard to the need to develop a secure parent-child attachment. Critically, decision-making must consider if the child's developmental needs can be responded to within the family taking account of the Assessment Framework andwithin timescales appropriate for that child. When a child who is subject to a Child Protection Plan dies, from whatever cause, the Lead Social Worker or her/his manager must inform the senior child protection manager, who will notify the safeguarding partners. Consideration will need to be given to the need for a child safeguarding practice review. This page is correct as printed on Tuesday 23rd of April 2019 03:49:05 PM please refer back to this website (https://sussexchildprotection.procedures.org.uk) for updates.